The well with no water! It all started with a lot of excitement. It was my first attempt in getting an open well dug in the farm. My dad joined in to help and was very happy too. But, we all knew the prospects of finding water were minimal. This land was abandoned since ages and there were no good waterways nearby. A beautiful lake in the vicinity was a good 0.5 km away from the farm. We began our adventure with a quick “pooja” and the digging began. 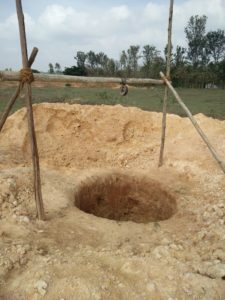 It was burning hot and the lone man who started digging the well already felt the hard rocky surface. He wasn’t confident either. 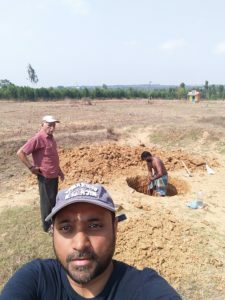 This was a big moment for me as I took a break from work, in fact the entire week off, just to make sure I could set the well up and get a permanent source of water for the farm. Unfortunately, it wasn’t to be so. After a few days of digging and twenty foot deep, nothing turned up. It was a big financial loss but what bothered me most was that not even a drop of water turned up in a village where farming was and has been the mainstay for centuries. It also made me realize the reality of the inherent challenges in farming especially for the one doing it to earn his bread. Not the one to lose hope, I have now advanced to getting the land tilled and using the well (with no water) as a reservoir during the monsoon season. Here is the well in its elegant beauty. The final touch up of having cement rings in the periphery is also done now. I also had the satisfaction of visiting the nearby temple which I never got to see up close so far. 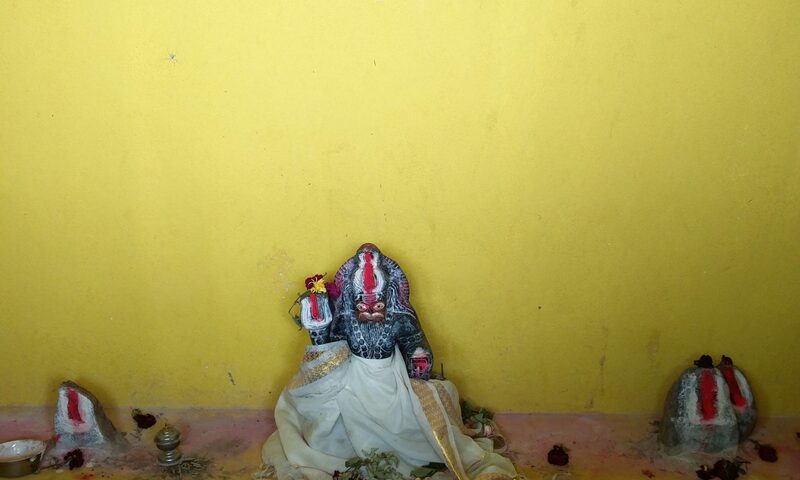 The deity Muneswara Swamy overlooks my farm land too. I took a snap of the beautiful stone idols in the secluded temple. My mission is to turn this land into a beautiful fruit tree orchard and a thriving miniature forest land. It is probably a few years down the line. Here is to my first failure! It was certainly those eyes. Yes, those big, dark, beautiful eyes staring back at me. I can never miss them. They stay with me whenever I look at them. Luring me into its deep mesmerizing spell. Taunting me with reflections of the past. The pleasant experiences that even forced a feeble smile on the lips and a heave of comfort to the heart. People say the eyes give meaning to this world. They are the truth seekers. They run stories in your memory. If they haven’t seen it, then you haven’t seen it, forever! There is no vividness to history without them. Those eyes staring back at me. Two equals, physically separate yet together, working in unison. Soulmates forever. They never deceive each other. They are eventually one. So is her mystery! Let me give her a name, Netram. I know…it isn’t a fancy name. Quite obvious to the knowledgeable few I would say. But, it is not about the name as much as it is about what happened that day. Netram saw many events in life. She packed a few for remembrance while mostly letting go of the rest as and when she passed them. Sometimes, the choice isn’t easy. It is hard to ignore but yet impossible to retain. Like the first time she was infatuated with someone. Such moments have no future but are so full of hope. But, the events on that one particular day was different. Netram woke up in the morning, reluctant to open her fluttering windows to watch the bright light of the Sun overpower her senses. She would soon adjust to the brightness of the day. But, she was tired. She needed her windows to be closed, soaked in darkness, watching nothing, for at least a good eight hours. But, smartphones, television and other inanimate objects also demanded her attention. As if the interaction with living beings wasn’t enough, as did her ancestors in the past, she had to keep up with dreams too. The ones that she thinks she is seeing but knows she isn’t but it doesn’t matter as she still has to see them no matter what! Netram began the day doing her usual stuff. Nothing special. Nothing unusual. It was a routine she got used to. What to look for and where? Whom to see and when? Her bakery was in the corner of a silent street in an otherwise bustling city. She was lucky to get the shop for lesser rent as her mother had initially set up the business in there a decade earlier. The landlord became friendly since then and allowed the place to be rented almost free of cost. The street was closed to vehicles. So, anyone who wanted to visit the array of shops that sold everything from hand towels to candles had to park their vehicles at a distance and walk. This made it a pretty setting as the trees were let to live without fighting for space with parking spots. Giant Gulmohar trees and other varieties all grew to their majestic gait, unbothered by human interference. Her bakery was hidden behind a lone mango tree that probably grew there before buildings, roads and even people habited that place. This tree was witness to a lot in the history of human progress. It had a wide trunk and branches that almost tested the strength of the walls of her shop. It didn’t bother Netram. She used the juicy fruits the tree bore every summer to add to her pastries. In fact, her bakery was known for mango tarts and mango cakes. The bakery wasn’t far from where she lived. A quick ride in her car was all that was needed. She had a habit of watching out for her cash box even while driving. She took it back home every night, emptied it into a vault she installed at home and brought it back empty to the shop in the morning. She had her usual set of customers who came in regularly. Sales were strong during the summer season, thanks to the mango tree outside. The rest of the year saw the customers trickle in once a week with an odd day when someone new showed up at her shop. Business was never bright but it wasn’t bad either. She managed to cover her expenses but it wasn’t enough to reap profits. For several years, Netram struggled with the monotonous life she led although baking was her passion and possibly the only reason she still had reason to remain cheerful. Then, it was this day. Netram planned her stock for the day and started preparing the ingredients for them. Her usual customers came in the evening and they knew things were prepared fresh for the day by then. She was done preparing her cakes in about two hours. She had the rest of the afternoon to sit down, relax and lazily pass the day. The silence in the street and the emptiness of her shop allowed her to slowly enter phases of darkness and light. As the darkness of her window was about to completely take over, the sudden chiming of the bells at the shop’s door shook her up to attention. Standing at the door, with the bright light of the sun obscuring the full view of the person was a little girl. She was alone. Probably about seven years old. She wore an orange colored frock, tattered at the edges below but otherwise beautiful with designs of white flowers printed all over the dress. Netram looked at her with curiosity. She never had anyone come at this time of the day. Moreover, she never had a kid come alone to her shop. Kids came with their parents in the evening. Never alone. This kid looked poor. Maybe she was here to beg for money or some food? The kid was cute-looking. She was barefooted and didn’t carry anything in her hands. The girl stopped short of approaching Netram. Instead, she turned around and walked about carefully observing the glass shelves that displayed all the cakes on sale. With her hands to her back, she trotted about checking the cakes making sure she didn’t touch the glass and make it dirty. Netram continued watching the girl in silence. It was delightful to watch a young girl, barefooted and all, walk about as if it was serious business. Netram gave her all the time she needed. The girl now started checking the paintings on the wall. She stopped at a few places where there were interesting pictures of village scenes where women with pots on their heads walked towards the horizon. The girl pointed her fingers towards the women in the painting as if to show it to someone. There wasn’t anyone there except for Netram. The girl continued uninterrupted as she now checked the floor, the modest tables and chairs and even the ceiling. She went back to watching the cakes after the inspection was done. She locked her attention at one particular cake. It was orange in color. The same as her dress. She picked the front of her dress, checked the color, looked at the cake, looked back at her dress and pointed her tiny finger at the cake. Netram watched wondering if this girl would ever buy anything or open her mouth and beg for something! The girl watched the orange cake to her utmost satisfaction. Once done, she clapped her hands and looked towards Netram. They exchanged glances for a long moment. There was complete silence in the air. The fan in the ceiling stopped spinning as the electricity was down. It was a usual thing. The power was gone for about an hour in the afternoon during winters. Then, the girl slowly extended her hands towards Netram. That very moment, Netram saw brightness, more and more light, blinding in its strength, as if someone shone a powerful lamp on her face. Netram struggled, adjusted to the light and then looked ahead. The girl was gone! She checked in the shop, checked her cakes and stepped out to see if the girl was on the street. All her cakes were intact. The girl couldn’t be found. She was gone for sure. Netram looked back in gratitude. The old couple made her day. Many customers came to her shop but never took the time to talk to her, to appreciate the work she put in setting up her shop and in preparing those tasty cakes. They never sat down to talk to her. They never made her feel like she was useful, of any relevance in the big, bad world outside. The couple sat down at one of the tables, enjoyed eating the orange cake and took a couple of them for home. They placed a tip on the table, wrote a note of appreciation on a piece of paper, thanked Netram again and left. Netram watched the couple slowly walk down the street. Adjusting her apron and feeling a sense of pride at her achievement in satisfying a customer, she then went about resuming her business. I never had great customers come my way in the years of business I did at my bakery. At least, not until the old couple showed up at my door. Full of life, happiness and having a genuine appreciation for the good things. Ever since that day, I had a great customer come in to my shop whenever the little girl visited my bakery and Netram caught a glimpse of her. Ever since then, I took the girl’s visit to my bakery as a good omen. My heart raced with excitement on the days that happened. It was rare but was always a blessing for me. It made my lonely heart prance about like a lamb near its mother. I also took it as a sign that I have to be at my very best. I cleaned up the shop repeatedly, shined the glass casings, took extra precautions to present my cakes in the best way possible and ah! yes, the color of the little girl’s dress was my winning cake that day. So, I created a special deck with a spinning base, a sparkling glass enclosure and placed my happy cake on that. It always attracted my special visitor, an unknown stranger, always a new customer and yes, the customer enjoyed the experience at my shop. Maybe everyone has a story to tell! About something less than a miracle, less than spectacular but yet special. Sometimes, it makes me wonder, who was telling the story? And whose story was it anyway? The words fluttered and flew in the wind. Imagination? Reality…Who knows? Who cares? It was time to get back to work. It has been a while now. Netram may soon catch a glimpse of that pretty girl and I have to get ready for my special customer. Anticipation of happiness is a wonderful feeling. Everything looked set. I adjusted the loose strand of hair falling on my eyes and walked away from the mirror.